This is (one of) my Halloween costumes (from last year!) that I revisited earlier this year - and here's a tutorial on how to make it! (There's still time before Halloween, it's doable!). The armor is latex and/or foam, and the dress is pleather. It was a challenge to make (first time doing a corset!) and *loads* of fun to wear! Happy Halloween everyone! Good luck finishing your costumes this week!! The big costume I made for Halloween this year was the top wizard himself, Gandalf. My Gandalf was based on his description in the book The Hobbit, with a little mix of Ian McKellen's portrayal, John Howe's paintings and my own spirit-guide drawing. It's not a very complicated costume but it was about the little parts that sold it. With the facial hair, makeup and facial prosthetics, (along with changing my gait and voice) I had everyone thinking I was a man until I squeaked out some words in my regular voice. It's definitely a costume I plan on wearing again! The eagles were busy - had to take transit. "Buttons? Do you like them?...I'm your Other Mother silly!" I put up a little tutorial on how I assembled the costume - it's a pretty inexpensive outfit to put together and works best if you have kids/short friends to be your Coraline Everyone got a real kick out of us. Thanks for looking! 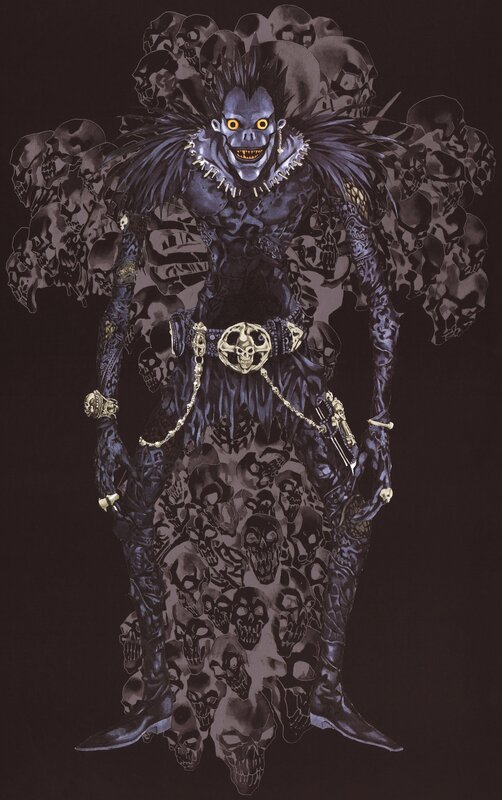 A few years ago I made a Ryuk costume from the anime/manga/movie Death Note - and I decided the time had come for me to revisit the series and go as another Shinigami (Death God) named Rem. Originally I was going to sculpt, mold and cast a latex suit, but after sculpting and making the torso, I hit a block. My mold locked and I couldn't get it open! I still wanted to make Rem so I took a different route to make a faster, cheaper costume. In a nutshell I made a bodysuit, glued craft and upholstery foam and backer rod to it, covered it with latex and repeated this method for the feet and hands. I also made a wig and face (chin and nose) prosthetic. It's not as detailed as I would like, but overall I am very happy with the results. I went to my (first) Anime Convention this summer, so of course I had to make a costume for it. Or two. Or four. The first one I made and wore was Avatar Kyoshi from the Avatar: The Last Airbender Series. She was the oldest avatar, with the largest feet, who got things *done*. Alright, so maybe some of her deeds didn't work out in the long-run...but who wouldn't want to dress up as the fiercest Avatar of them all? I made it all (except the shoes!). This costume could still use a few tweaks, but regardless it was an interesting experience to make and fun to wear (save for the 6" boots). The fans/headpiece were brass, the bracers were leather, and I used white alcohol based makeup (the same stuff for my Aisling cosplay). I recently made a tutorial on how to make the fans for all you future Kyoshi Warriors out there! Bjork's swan dress; love it or hate it, you know it (and for those who don't…well, I guess you can say for Halloween I went as a 6'2" swan). This costume has been on my to-do list for a while now and I decided this was the year! It was the third Halloween costume I made for myself for 2013 and was actually easy to construct, just very time consuming. I love it. So. Much. I want to go to prom in it. I want to be married in it. I want to eat it!! (I guess that means it look, feels and possibly would taste delicious…?) I wrote up a full tutorial on how to make it over here. After slaving over a bunch of costumes earlier in the year, I wanted to do something easy and comfortable for Halloween (Catwoman in a sweater) but...I also wanted my husband to have an awesome outfit. So we decided to combine our skills and go as everybody's favorite Ghostbuster couple, (bearded) Venkman and Zuul! We weren't going for screen accuracy (there wasn't time and really, I was not in the mood to try and match every detail) but I think it works! I bought a used flight suit off of ebay and sanded down the zippers (to reveal the brass underneath). I got the patches and three "name tags" from an ebay store. The white pilot pistol belt was from amazon and so were the rubber gloves. The gloves had text on them but that was removed easily with some rubbing alcohol. My wig was a Posie Wig from ebay. And I (eventually) found the fabric for my dress - sheerish orange organza and gold taffeta. I wanted silk and lamé but I couldn't find any close to the right colour!!! So my Zuul dress isn't as drapey as I would like it. The Ghostbuster uniform belts are grey, so I decided to dye the canvass belt. I hate dying stuff. The last thing I "dyed" was my Ryuk wig - which was a horrible experience - and before that...I can't remember, probably because it was so traumatic. Much to my surprise, it worked! You can find very detailed schematics for the proton pack online. I took one look at them...and decided, no screen accuracy this year! I decided to do one that would look "good enough." We really didn't want to buy anything to make the pack, so I made the entire thing out of cardboard and paper, with a few lids and spools added on. We did have to buy spray paint, and some tubing. It's amazing how spray paint makes everything better! My husband made the gun, and wired up lights and a speaker to both the gun and proton pack. Again, the lights aren't in the correct place/the right colour, but at this point we were using what supplies we already had and what looked cool. There were blinking lights, triggered lights, and he had a speaker setup to play sound effects and songs from the movie. I also ordered grey elbow pads and a yellow leg hose, but they didn't arrive until the day after the party (we'll use them next year!). We went to a party and everybody loved our costumes. And as a bonus, someone was dressed as Stay Puft. Very fitting. And yes, my husband is more of a (bearded) Spengler than a Venkman - I ordered three name tags and put velcro on the backs of them, so he can change his character depending on his mood. My dress wasn't based on any pattern - I took a big tshirt and around that drafted a batwing dress. Maybe I'll try tackling it again next year with the 'right' fabric and some draping. There is no Tatterhood, only Zuul! I feel like I've been making costumes all year-round, so I really wanted something comfy, cute, easy and quick to do for Halloween. Artist Hanie Modh has drawn a variety of superheroines/villains in sweaters - which are all so delightful and fun, so I decided to create a costume of her Catwoman. Surprisingly I couldn't find the right grey sweater, so I made my own out of a soft knit fabric (and pin-tucked the cuffs and giant mod-avant-garde collar-cowl). For the sweater pattern, I used Burda 7742 as a guide (I lengthened the torso and the arms, and then winged the cuffs, collar and neckline). The little cat face was cut out of fleece, embroidered, then stitched onto the sweater. I kind of mucked up the mouth embroidery, but then again, it was 2 in the morning on Halloween! I decided to make her little cat-aviator-hood out of fleece (to keep things cozy). I looked at cowl patterns from past animal costumes, quickly cut one out of scrap material, then kept tucking and pinning it around my head until it was relatively tight (then made the final fleece version using the scrap one as a pattern). I didn't want to bother with a proper strap, so I sewed a thick piece of black elastic where a chin strap would normally go. The ears were pairs of triangles sewn together and flipped right-side out. I propped a piece of cardboard in them before sewing them to the cowl, to help them stand up a bit. Pair with black tights, black gloves, black shoes, some red ski goggles and a little bit of eyeliner, and voila! The Sweater Superheroines make really great, really easy costumes, so ladies, if you find you're running low on time next year, they are go-to costumes! Everything was either made or heavily altered, including the boots. I bought old leather coats from Value Village, took them completely apart and cut out pieces from the leather sections for the patch-worked long shirt and leather pants. These pieces were given texture with a wood-burning tool. I also made a pleather-and-leather belt, leather belt bag and leather notebook. I sculpted 3 resin rings, 2 bracelets, earring, "arm skull", buckle, belt end, chain connector, pen, belt and notebook cross out of plasticine, then casted them in either resin or latex. I used shrink-dinks to make the chains, staples and teeth. I sculpted the mask on a copy of my face, made an ultra cal mold, then cast a latex mask. The eyes are resin (cast from halves of ping-pong balls!) and the pupils are from old sunglasses. The wig was "painted" (it was a auburn pointy wig before) and glued to the top of the mask after painting. For the feather epaulettes, I pulled the tips of the feathers through fabric and dabbed a bit of hot glue on them to hold them in place. This feather-adorned fabric was sewing to giant shoulder-pads I had made (that were later sewn onto the shirt). There are over 350 feathers! I kind of want to remove them from the costume and just wear them on their own, heh heh. For a more in-depth read/process photos of the costumes, please check this out! And if you just want more full body costume photos, you can go here!